Biography of Flemish Painter, Noted for Merode Altarpiece. Frankfurt am Main Art Gallery. Flemish painter Roger van der Weyden. One of the finest Northern Renaissance artists, the work of this Netherlandish painter, who is sometimes also known as the Master of Flemalle, or the Master of Merode, centres around two panels of a triptych (now in Frankfurt, Stadelsches Kunstinstitut) which came from the Chateau of Flemalle near Liege. Attempts to identify the Master of Flemalle have led to controversy which still flares up from time to time. 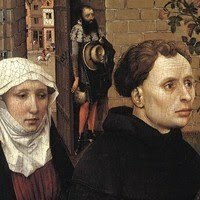 Three Flemish painters have been suggested over the years - Roger van der Weyden, Jacques Daret, and Robert Campin - but scholarly opinion now accepts that Campin and the Master of Flemalle are one and the same, despite the absence of conclusive proof. 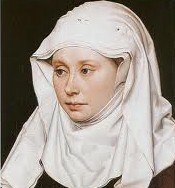 Campin was a painter from Tournai in whose studio Roger van der Weyden and Jacques Daret worked between 1426 and 1432. An expert in oil painting as well as tempera, he is regarded as one of the great pioneering Old Masters of early Flemish painting. The devotional altarpiece known as The Seilern (Entombment) Triptych (1410, Courtauld Institute Gallery) seems to be the artist's earliest work: comprising an Entombment and a Resurrection, with a donor kneeling at the foot of Golgotha. It is an involved composition distinguished by fine silhouettes, very graceful and International Gothic, and a continuity of volumes accentuated by the heavy, massive folds of the draperies. The originality and power of Robert Campin are particularly evident in his mature works. The panel depicting the Bad Thief (Frankfurt, Stadel. Inst.) is the upper fragment of the right-hand panel of a great triptych devoted to the theme of the Deposition, a work whose form is known through an old copy in the Walker Art Gallery, Liverpool. 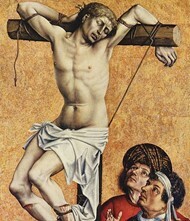 The figure on the cross is brutal in its realism, with its stretched muscles and atrocious wounds. The whole is accentuated by the staccato rhythm of the contours, which stand out against a gilt background. Expressiveness is carried to the point of ugliness, and is evident in the faces of the other two figures, which are all the more striking for the powerful modelling that gives them an almost sculptural quality. The two Flemalle panel paintings are similar in character: the figures of the Virgin and Child and St Veronica are placed on a lawn sprinkled with symbolic flowers and in front of a damask cloth that isolates them in a restricted space. There is an expressive vigour about them which also animates the grisaille of the Trinity on the reverse of the St Veronica panel. on holy themes, see: Religious Art. Flemish artist of the Bruges School. In small works, the monumental character gives way quite naturally to quality of expression. One painting, a panel of the triptych altarpiece in the Prado illustrates the difference in genre. On the reverse, St James the Great and St Clare, worked in grisaille-like statues in niches, are similar to the larger figures, but give a foretaste of a more refined method of execution. The Marriage of the Virgin is depicted with a characteristic richness of detail. The work is alive with figures, some of whose faces are twisted into grimaces bordering on the grotesque. This taste for the anecdotal showed no sign of weakening in what are presumed to be the later works, but, here, inessentials are stripped away to arrive at a more synthetic vision. The Nativity in Dijon Museum contains one of the first northern landscapes. Care has been taken to unify the figures placed before the stable in the background, partly by the artifice of a winding road, partly by the even spread of the light. The sparse trees lining the road are picked out by a white light which is singularly evocative of winter days in the Low Countries and the whole constitutes a decisive step forward in the new realism. The same vision lies behind the Merode Altarpiece (1425, New York, Cloisters), one of Campin's most famous religious paintings, produced about the same time as Masaccio's frescoes in the Brancacci Chapel. The scene shows an interior in which each detail is carefully analysed; everyday objects are treated with a poetic insight, even though their inclusion would in any case be justified on symbolic grounds. In the right-hand panel, St Joseph is depicted as a simple carpenter working in his shop, which opens out on to the town square. On his workbench, alongside familiar objects, is a mousetrap. The Virgin with the Firescreen (London, N.G.) shows the Virgin suckling her Baby, seated on a bench against the chimney-piece; she is protected from the heat of the fire by a wicker screen which forms a sort of natural halo about her. This same love of intimate scenes led the Master of Flemalle to depict, on one shutter of a small diptych in the Hermitage, the Virgin seated and warming herself near the fire, with the Child naked on her knees. Linked to this composition is a representation of the Trinity, conceived according to a formula which is sometimes referred to as the 'Throne of Grace': God the Father, seated on his throne, holds the dead Christ in his arms, while the dove of the Holy Spirit perches on Christ's shoulder. Another version, more or less the same size and on the same theme (Louvain Museum), is perhaps also by the Master of Flemalle, or at least from his studio, but it has been seriously damaged. Both these works are variations on the composition painted on the reverse of the St Veronica of Frankfurt. On a small panel, now in Aix-en-Provence Museum, Campin represented, in a composition he frequently returned to, the Virgin and Child seated on a throne in the sky, with her feet on a crescent-shaped moon, according to the vision of the Apocalypse. Here, a monk kneels on the ground between St Peter and St Augustine. Several examples of portrait art have been attributed to the Master of Flemalle. Among these are a pair showing a Man and Woman (London, N.G. ), a Musician (private collection), and Robert de Masmines (two versions, one at Berlin-Dahlem, the other in Lugano, Thyssen Collection). They are striking for the attention paid to the faces, and the precision of the detail. The latest surviving work, and the only one to be dated, is a triptych of which only the wings remain (Prado). Commissioned in 1438 by Heinrich Werl, provincial head of the Franciscan friars of Cologne, it shows the donor being presented by St John the Evangelist to the figure of St Barbara who sits reading. This is a more supple, less violent work with a more refilled light and more delicate relief, which reveals the influences of Campin's contemporaries, together with that of the younger artists like Jan van Eyck (1390-1441) - already famous for works like the Ghent Altarpiece (1425-32, St Bavo Cathedral), and the complex Arnolfini Portrait (1434, National Gallery, London). See also works by Petrus Christus (c.1410-75), van Eyck's most important follower. The compositions of the Master of Flemalle/Robert Campin were held in high esteem and were frequently copied. Some, in fact, are only known through copies. Among these are: The Virgin and Child in an Apse, a Mass of St Gregory, The Adoration of the Magi, The Vengeance of Thomyris, Jael Slaying Sisara, St Luke painting the Virgin, a Virgin and Child with Saints and Donors, and a Crucifixion. This powerful art could never be classed among the youthful work of Roger van der Weyden unless one assumes a radical change of spirit at some stage of his life. (But see Weyden's Descent From the Cross, 1435). There is no attempt in these works to match Roger's finesse or the harmony of supple, well-balanced lines. The Master of Flemalle is a plastic artist constantly seeking a more powerful means of expression. His forms are depicted in cross-hatched rhythms which exclude all real grace and take on a brutal, peasant look. His contribution was essential to the development of Netherlandish panel painting in the 15th century, and to the direction of Northern Renaissance painting. Paintings by Robert Campin (Master of Flemalle) can be seen in some of the best art museums in the world.